Glass managed to rank third all time over the MLK holiday frame and easily top the box office. This week's offerings include a kid-friendly twist on a classic story and a film involving a man who just wants to start over, but whose past comes to to track him down - and warp his reality. It's tough to say if either film has a real chance at making a run at the top of the box office, but with Glass performing a bit below expectations, things could be a bit more open. 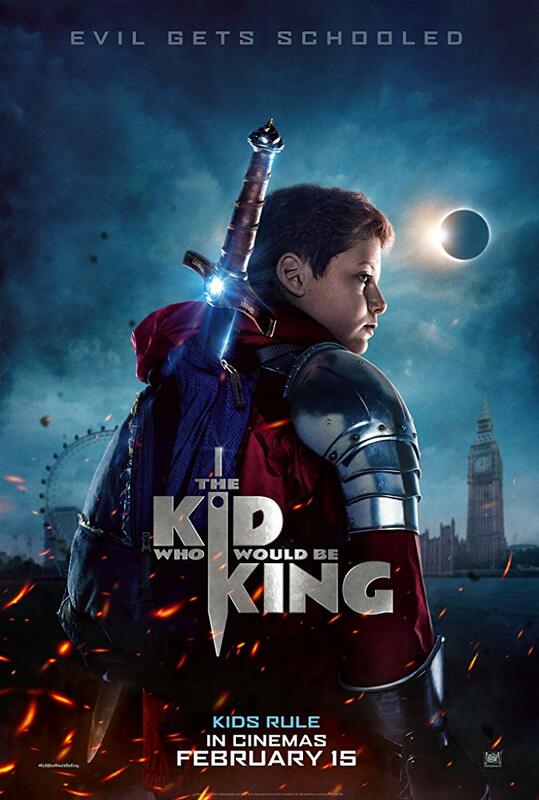 THE KID WHO WOULD BE KING As I said back when Robin Hood was released (and failed miserably), Hollywood has a terrible track record at turning both Robin Hood and King Arthur into box office hits. The Kid Who Would Be King might buck this trend, if only because it has the benefit of casting a wider net with a story for families. In this tale, the unremarkable Alex (Louis Ashbourne Serkis) finds himself part of a remarkable story when he pulls the fables sword from the stone. He finds Merlin (played by both Angus Imrie in younger form and Patrick Stewart in older form) who tells him it is his destiny to stop Morgana (Rebecca Ferguson) from unleashing destruction on the world. Thus Alex finds help in the form of two of the strongest people he knows, Lance (Tom Taylor) and Kaye (Rhianna Dorris) who, along with his friend Bedders (Dean Chaumoo) from their own round-ish table of sorts. I mean, it looks good for the younger crowd, but I don't see adults flocking to this one on their own. And I don't know if late January is exactly the best time to be targeting families, which tells me this will have limited appeal. It still might perform decent, but I don't think it will be enough to top the box office by any stretch. SERENITY The more a movie is under the radar, the greater chance your general movie-goer is going to ignore it. 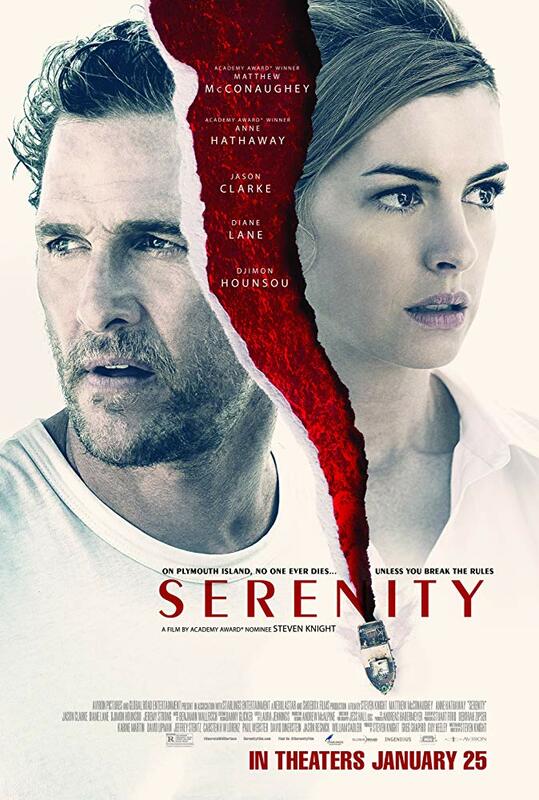 Despite having a cast including Matthew McConaughey, Anne Hathaway, Diane Lane, Djimon Hounsou and Jason Clarke, I've pretty much heard next to nothing about serenity. And it's too bad, because the plot looks interesting: McConaughey plays Baker Dill, a fisherman living an idyllic life on the tropical Plymouth Island - a life that is shattered when his ex-wife Karen (Hathaway) begs him to get rid of her violent husband Frank (Clarke) on a late-night excursion that turns into murder and shark feed. Baker suddenly finds himself thrust back into a life he thought he left behind - and a life that may not be what he thinks it is. I mean, it sounds convoluted but also interesting and I like the cast well enough. As I said, marketing on this has been on the light side and even with the star power I don't see this having a major impact at the box office. I could be wrong, but top five might be the best it can hope for. The two new wide releases will have to deal with Glass, Aquaman and The Upside - we'll see if audiences prefer something old or something new come Sunday.